Sometimes I become worry that when I go back home to Scotland my friends will ask me what Australia is like and I’ll only be able to tell them about Melbourne’s finest um… bars. Not like there’s anything wrong with that but it’s time to see what else is out there. So I’m on my way to Cairns. Of course I’ll be leaving my heart in Melbourne but I’ll be back! First stop: Sydney. The first impression I got is that it is a lot like London. The streets look similar, albeit more tropical in this climate. The atmosphere is influenced by London’s trendy culture which is catered for those with a bit more dough to throw around. With this you get the vibe that Sydney is not as welcoming or humble compared to Melbourne but let’s give it a chance..
To kick off my first day I decided to go see some oddly shaped building I thought no one cared that much about. Turns out the Opera House is quite a big deal. Capture a shot of the Opera House and the Harbour Bridge to send to mum then have lunch in Opera Kitchen or one of the other eateries on the boardwalk overlooking the view. You’ll see all walks of life, from Asian tourists, local school children and joggers. Hey mum, this is the Opera House. Do you know how many Asian tourists I had to battle to get this photo?? If you’re a keen runner then get your shoes on and join the Sydney craze. The Royal Botanic Garden is perfect for a good run. It is nestled next to the Opera House and while I did none of that exercise nonsense I enjoyed a leisurely walk admiring the sights of the gardens towards the Art Gallery of New South Wales. Admission is free and the galleries hold some interesting sculptures and paintings. If art isn’t your thing then their WiFi is free and fast. You’re welcome. The next day I went to the famous Bondi Beach. Bus tickets can be bought at convenience stores and are fairly cheap so it’s worth hopping on. After you’ve soaked up Bondi, home of cute lifeguards (Bondi Beach Rescue anyone?) and impressive graffiti art, take a walk to Bronte Beach. The trail only takes 20 minutes to walk and follows the cliff edge so the view is always gorgeous. The dog on the left obviously didn’t get the ‘look too cool for the camera’ memo. Once at Bronte take a dip in the Bronte Bath. This is a pool next to the ocean – because with all that water you need more water. It looks as if the cliff naturally protrudes a glimmering circular pool before it meets the ocean. I felt as if I was in paradise. You could not get a better seaside experience than this. Yes that’s right, ditch the sand and even the sea. Lounge in that man-made pool. Capitalism! My third day was labelled as Museum Day. A: Because I’m a nerd who can spend hours in a museum. B: It was forecasted to rain. I suggest for a fellow nerd the Hyde Park Barracks Museum. For $5 on a concession ticket you can learn all about the history behind Australia’s first ever convicts. Just down the road is the Australian Museum which is $8 concession. This has more sensational exhibits, such as dinosaurs. Everyone likes dinosaurs. I can now confirm that dinosaurs ARE in fact, extinct. After this I detoured from the plan and ventured down to Paddy’s Markets in Chinatown, only a 20 minute walk from the museum. Here you can find stalls selling the weird and wonderful, Asian style. To finish the day I hiked from Chinatown to the Rocks. It is one of the oldest suburbs in Sydney with sites of some of the first few settlements. Nowadays, upmarket eateries and fashionable night life spots occupy the area. A free tour which tells you the fascinating story behind the Rock’s menacing past starts at 6pm outside Cadman’s Cottage. Did I mention its free? They also take you to the Observation Deck which is a great vantage point for photos. One of Sydney’s trendiest suburbs is Paddington. The next day I headed along Oxford Street to the Australian Centre for Photography. I was impressed by the diversity of the exhibitions and my favourite was ‘Dear Slyvia’, the title being an ode to poet Slyvia Plath. The installations reflected girls with struggles ranging from sexual slavery to war conflicts. The whole gallery is free to the public. Next up was the Blender Gallery. A bit smaller than your typical gallery, this shrine to rock and roll is converted from a terraced house you have to find nestled in suburbia. Step inside to explore memorabilia in the form of framed photographs, magazines and books you can buy. Upstairs is a room wholly dedicated to photographs of Kurt Cobain, it’s Nirvana. Ba dum tss..
On the weekend just cross over to the other side of the street to the Paddington Markets, 10am to 5pm. Have your palm read and enjoy live folk music while sipping on home made lemonade. In the afternoon I went to the Museum of Contemporary Art before getting ready for dinner with my Aunt. We went to Wilbur’s Place, a neat little restaurant tucked away in a laneway on the less eccentric side of Kings Cross in Potts Point. I recommend the Chef’s vegetarian gnocchi which isn’t on the menu so just ask for it. Afterwards we went to Gelato Messina. The ice cream is so good, the queue lined the street outside as if I was waiting to get into a popular club. My last adventure of the day was to meet some friends in Double Bay for my first taste of Sydney nightlife. I met them in the Golden Sheaf which is only a small hike from Edgecliff station. On a Saturday night this place was packed and don’t stick out like a sore thumb in your singlets and thongs.. this place is a bit nicer than that. Head outside where you can sit outside under the canopy of a large tree with fairy lights or head over to the dance floor. Inside it fashions a British style pub so there’s something for everyone. With an amazing hangover I explored the suburb of Newtown the next day. I was drawn to this area after being told I would be reminded of my hipstery haven of Fitzroy back in Melbourne. So on that note visit Retrospec’d, a clothing vinatge store with pieces dating back to the 1940s and 50s so you’re getting the real deal. For vintage bric-a-brac head over to Drunk on the Moon. To further induce my hangover I voyaged a ferry from Circular Quay to Manly. On a Sunday all travel with an Opal card costs only $2.50. Opal is Sydney’s transport ticket that will get you on trains, buses and ferries, so go wild. All day, just $2.50.The minimum top up is $10 but if you’re like me and you’re just a visitor, reclaim the $7.50 back into your Australian bank account. In Manly laze on the beach or go surfing. When you need to be watered and fed go to the Bavarian Bier Cafe before hopping back on the ferry to mainland Sydney. Easy. After a much needed sleep came my final day in Sydney so for my last hurrah I joined a tour of the Blue Mountains. You can take yourself all the way there on the train, (for $2.50 return on Sundays remember) and try to navigate the trails yourself but I signed up to join a tour with Colourful Trips. The price is around $125 for return transport, a ticket to Featherdale National Wildlife Park, guided walks and lunch. I was lucky to have friends in the right places and got the price knocked down a little bit but I’d say the full price is still worth it. First was Featherdale Wildlife Park where I pet koalas and fed kangaroos. The park has everything from colourful parrots to scary crocs and spiders – eeeesh. Next we were guided on walks to spot the Three Sisters and the valley beyond. The family owned Scenic World offers an aerial lift over the valley or the Scenic railway – the world’s steepest passenger train since 1945! That’s for all you lazy people out there… yes, I did use it to get back up. So that’s it. 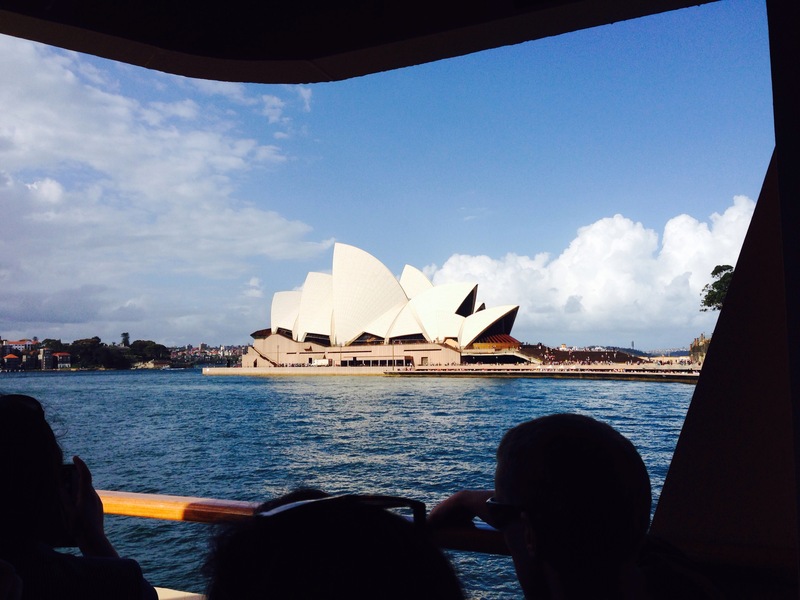 My week in Sydney. It’s fair to say I’ve never packed so much into one week. I hope this serves as a guide of where to go and what to do, especially on that backpacker budget. Here’s a summary of where to go! Wilbur’s Place, 36 Llankelly Place. Gelato Messina, 1/241 Victoria Street. The Golden Sheaf Hotel, 429 New South Head Road. Drunk On The Moon, 247 Australia Street. Bavarian Bier Cafe, Manly Wharf. Have you been to Sydney? What did I miss?